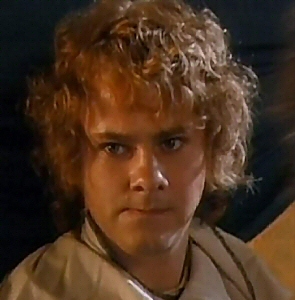 Meriadoc, son of Saradoc, was a Hobbit of the Shire, and from FO 12-64 the Master of Buckland. Following the War of the Ring, Merry was rewarded for his valour by being made a knight of Rohan. Upon his return to the Shire, he became one of the leaders of the Hobbit forces in the Battle of Bywater. When his father died, he became Master of Buckland, and in FO 14 was made a Counsellor of the North-kingdom. He married Estella Bolger, sister of his friend Fredegar, and continued to maintain contact with the friends he had made during the war. He wrote a number of scholarly works, among them Herblore of the Shire, The Reckoning of Years, and Old Words and Names in the Shire. In FO 64, he and Pippin resigned their offices and rode to Rohan and Gondor, dying in the latter realm. They were buried in the House of the Kings. In Rohan he was known as Master Holbytla and Holdwine of the Shire. To Men of Gondor, he was called Master Perian. As Master of Buckland, he was also known as Meriadoc the Magnificent.